Since March, I have been working on changing the landscape in my yard. While I'm not yet finished (I own over an acre), I have managed to put a large dent in the front yard around the house. I still have a lot of work left to do, but it is coming along. Before I reveal what I have done thus far, I would like to share my garden blessing with you. This particular blessing is designed to do two things: 1) bless the garden so that it flourishes and 2) to establish a garden guardian. Garden guardians will help protect your garden from just about everything, including pests, but that doesn't mean you don't need to take the proper precautions to avoid an infestation. During the Full Moon, gather your supplies and head out to your garden. Find a quiet place to perform your ritual where you will not be disturbed. Set up your miniature altar on the flat surface of your choice as shown below. To assist me now with my garden's birth. Combine our magics to undertake this garden's care. 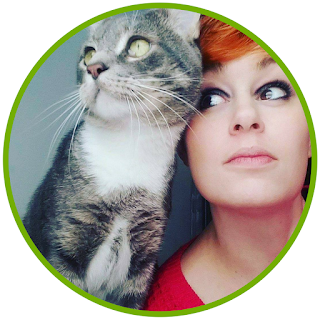 With your help, I bless this place. This garden of mine will flourish and grow. Bless each flower, one and all." For blessing my garden and this place. Protect it faithfully until pardoned." 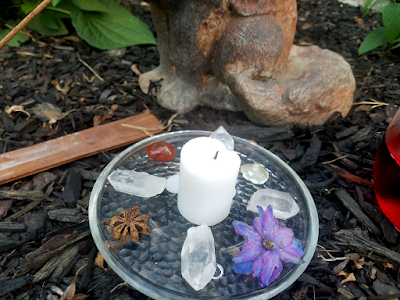 When you are finished, let the candle burn out while you meditate on the garden growing nice and lush. If you are short on time, meditate for 5 minutes and snuff out the candle. Why was this ritual set up the way it was? 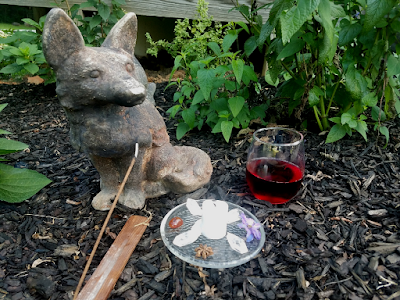 This is something new I decided to do for each of my spells and rituals posted on this blog because I felt a lot of times we find a spell online and go through the motions without really understanding why it was done the way it was. First, why the full moon? The full moon is a great time for blessings, which is what this ritual is, makes sense to use it to aid in your magic. Furthermore, when the moon is at its fullest, its magic is more powerful, and thus increases the potency of your own magic. Next, the incense, if you used one that is for blessing, cleansing, or purification, was to clear the space to unwanted energies and help get you in the mindset for working the spell. As you walked around the garden three times, three being represented of birth, life, and death all things your garden will have, you visualized the garden growing healthy and lush. 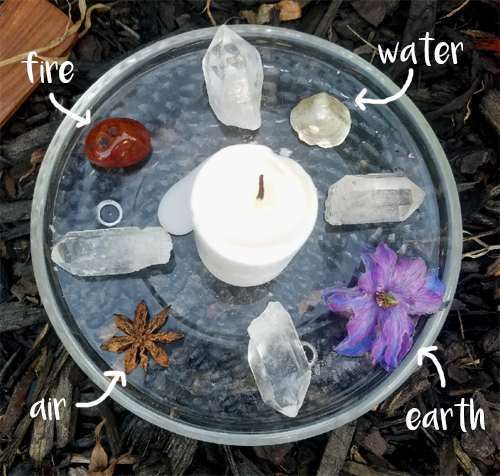 These visualizations set your intention for the ritual to come, infuses your magic into your garden, and empowers your garden. So why the altar set up? 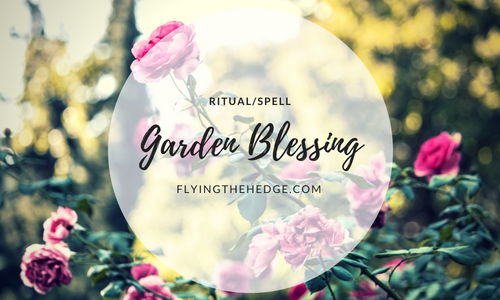 The candle helps to focus your spell intentions and gives reverence to Gaia, our Mother Earth, that you are asking to assist in your garden blessing. The element representations call forth the power of the elements and their spirits to also aid in your garden's growth. You will need earth, water, air, and fire for your garden to be healthy. The earth provides a place for your plants to take root and with the nutrients they need to grow strong and lush; water provides them with support so they can grow tall and is required to make food; air provides the plant with oxygen and carbon dioxide so it can carry out basic cellular processes such as photosynthesis and cellular respiration; and fire, in the form of the sun, provides your plants with an energy source so they can grow and reproduce. The quartz crystals amplify your magical workings, enhancing the spell's power. Gaia was chosen as the archetype or goddess for this ritual because she is Mother Earth. What better deity to call upon for a garden than our own Earth? I believe the words spoken in this ritual are fairly straightforward. We called upon aid, asked for them to bless the garden, infused the garden with our own magic, and asked that until we release the spell, their help is needed. Red wine or juice was chosen for this ritual to represent blood, which is representative of life. 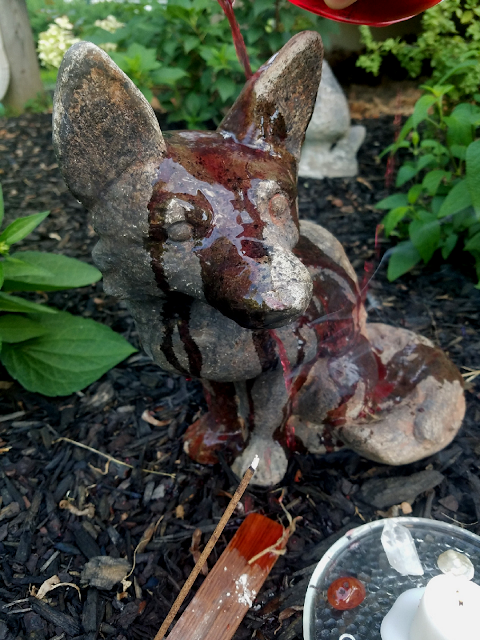 When you pour the red wine over the garden guardian, you are giving it life to protect your garden. If you don't have red wine or juice on hand, you can use water, which is also a life giver. When choosing your garden guardian, pick something that speaks to you. 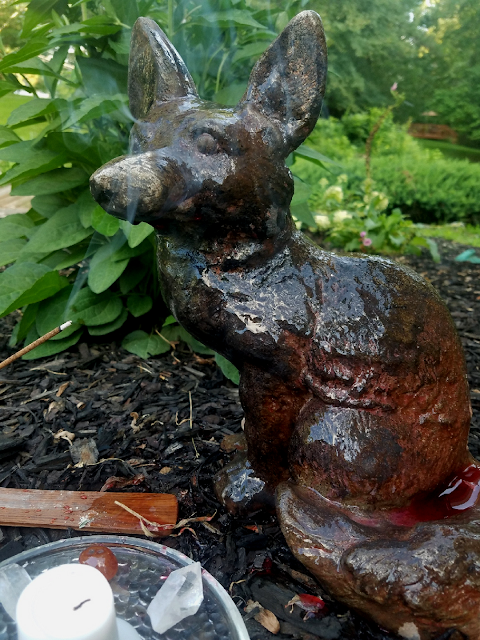 As you can see from my ritual I chose a fox as my garden guardian. Surprise, surprise right? Because the fox is one of my animal guides, and the animal that speaks to me the most, I felt it was the perfect guardian for my garden. Other options could be a gnome, fairy, or human statue. Whatever you choose, make sure when you are done you place the guardian someplace where it can easily watch over your garden for you. Looking to break this spell? Thank your garden guardian for protecting your garden and say they are released from their duty. Pretty simple! Remember to record your spell in your BOS or on your very own spell/ritual log worksheet.